The University of Southampton has flicked the on-switch for the most powerful university-based supercomputer in England and the third largest academic supercomputing facility in the UK. ‘Iridis4’ will also enter the top ten of the UK’s elite supercomputers. In a deal worth £3.2 million, Southampton’s new supercomputer is powered by IBM Intelligent Cluster solutions and designed, integrated and supported by HPC, data management, storage and analytics company OCF. It is four times more powerful than its predecessor Iridis3 and has 12, 200 Intel Xeon E5-2670 processor cores, a petabyte (or one-million gigabytes) of disc space, with 50 terabytes of memory. The new machine is one of very few in the UK to include to Intel Xeon Phi coprocessors, which can take control of some of the most demanding mathematical calculations to significantly increase its processing power. 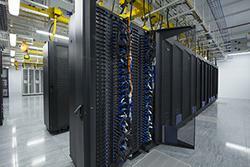 The Intel Xeon Phi coprocessors are each capable of running at one teraflop, (one trillion calculations per second). Iridis4 will mainly be used for research by University staff and students across a wide variety of disciplines, from Engineering to Archaeology – Medicine to Computer Science. 2 It is estimated around 350 projects are likely to run on the machine in the first year. “Staying ahead of the game in High Performance Computing is vital to help the University stay competitive. Simulation and computation enabled by HPC are recognised globally as the ‘third pillar’ of modern research and this investment will ensure we remain world leaders in this field,” said University of Southampton Pro Vice-Chancellor, Professor Philip Nelson. “The growth of Big Data and the availability of computing power like Iridis4 means that the range of research areas that are enabled by supercomputing continues to grow. We look forward to seeing its impact on the University’s research, already recognised for the range and importance of the science conducted on the supercomputer’s predecessor, Iridis3,” said Steve Legg, IBM’s University Programs Manager in the UK. Iridis3 will remain in operation, providing an important resource for industrial research through the e-Infrastructure South Consortium that also includes Bristol, Oxford and University College London and operates a ‘Centre of Innovation for the Application of High Performance Computing’. This was set up in 2012 with £3.7 million from the Engineering and Physical Sciences Research Council (EPSRC) to upgrade Iridis3 and install resources at Rutherford Appleton Laboratories near Oxford. Copyright is a thorny problem for the digital economy and companies around the world, and Google’s copyright and takedown process can be a mystery that has dramatic consequences. Bath-based IT and consultancy firm IPL specialises in data analysis and has publishes its independent report on Google’s copyright notice and takedown process for links in its search results. Using data gathered on Google’s takedowns over a 12-month period between April 2012 and March 2013, IPL developed a mathematical model to show how well the process is currently working and pinpoint the internal and external factors that affect consistency. The report found that despite the volume of requests that Google receives having grown significantly (from less than two million in April 2012 to more than 18 million in March 2013), Google’s performance in terms of timeliness and accuracy has remained consistent. As well as enabling Google to assess its performance over time, the model can be used by other companies who have to deal with similar takedown requests to perform similar analysis, and to compare this to Google and anyone else using the model. Moreover, by modelling the relationship between the volume of requests, accuracy and timeliness, Google and others can assess the likely impact of changes to legislation – such as the imposition of a time limit for each takedown request. You can register for free to access the report on IPL’s website. A team from the University of Bristol has developed a way to provide feedback from a screen without touching it. The team from the University of Bristol’s Interaction and Graphics (BIG) research group has used a phased array of ultrasonic transmitters to focus high frequency sound onto a target in mid-air. This would be used to provide positive feedback for a gesture-based user interface. The research paper, to be presented at the ACM Symposium on User Interface Software and Technology (UIST) 2013 by Tom Carter from the Department of Computer Science, will unveil UltraHaptics, using ultrasonic vibrations for the first time to deliver tactile sensations to the user. The ultrasonic transducer array emits very high frequency sound waves that can be steered by changing the phase. When all of the sound waves meet at the same location at the same time, they create sensations on a human’s skin. Finally, the research team explored three new areas of interaction possibilities that UltraHaptics can provide: mid-air gestures, tactile information layers and visually restricted displays, and created an application for each. Tom Carter, PhD student in the Department of Computer Science’s BIG research group, said: “Current systems with integrated interactive surfaces allow users to walk-up and use them with bare hands. Our goal was to integrate haptic feedback into these systems without sacrificing their simplicity and accessibility. A SouthWest firm is taking delivery of a new 60GHz chipset for gigabit wireless links over several kilometres. 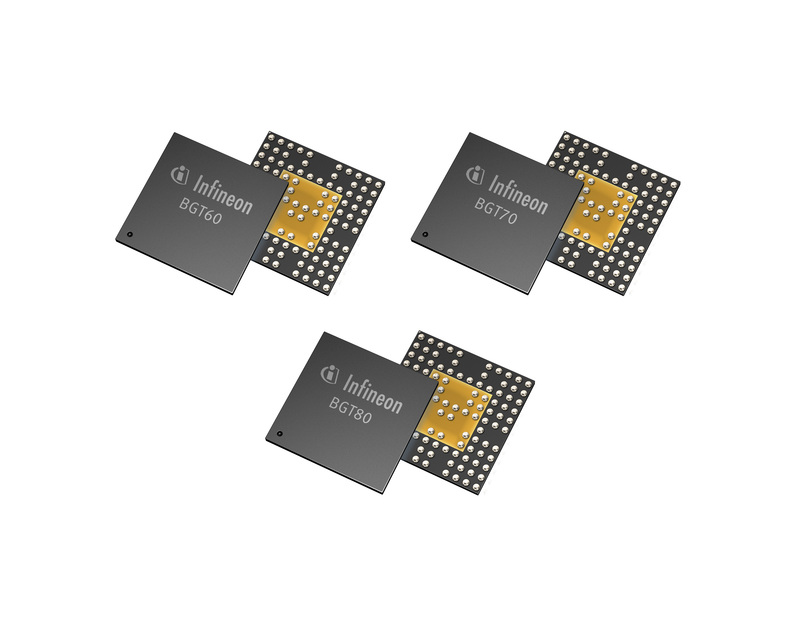 Infineon Technologies has started the production of its BGTx0 chipsets for wireless backhaul communication systems, shipping to Sub10 Systems in Newton Abbot. The lead customer Sub10 Systems is currently qualifying BGT70 and BGT80 E-band transceivers for an FDD (Frequency Division Duplex) system. Mark Stevens, Chief Technology Officer at Sub10 Systems, said: “We are delighted to be collaborating with Infineon on integration of the BGT70 and BGT80 chipset into our newly developed E-band transceiver. We expect high performance and high reliability at the same time, therefore we have chosen the best solution in the market.” The targeted system supports a data rate of more than 1 Gbit/s with link distances of about 2.5 kilometers. The transceiver family provides a complete radio frequency (RF) front-end for wireless communication in 57-64 GHz, 71-76 GHz, or 81-86 GHz millimeter wave bands. Paired with a baseband/modem, the system solution requires less space, offers improved reliability and lower cost for the critical wireless backhaul links needed in mobile base stations that support LTE/4G networks. Engineering samples of BGTx0 transceivers are already available. Volume production is planned for spring 2014.